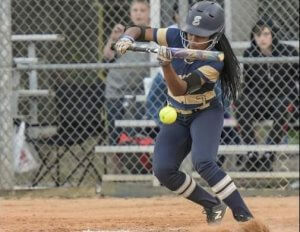 Leea Hanks has led Eustis (Florida) High to a 13-0 record and has become a team leader for the Panthers. 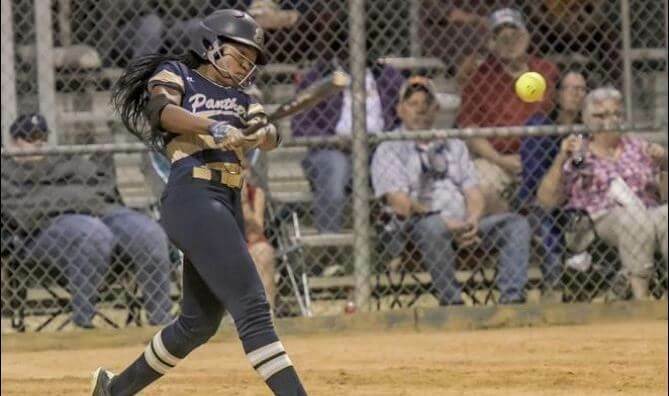 You can’t have a better week at the plate than Leea Hanks did as the 2019 outfielder for Eustis (Florida) High went 12-for-12 with two inside-the-park home runs, three doubles and a triple to earn Extra Inning Softball’s National High School Player of the Week honors. Leea, a Notre Dame signee and a top 20 ranked player in the 2019 Extra Elite 100, would tell you that the most important part of her big week at the plate was that the team has jumped out to a 13-0 mark. Leea earned All-State honors as a junior and sophomore. The Panthers are currently ranked 2nd in Class 5A and in Central Florida by the Orlando Sentinel (behind Winter Springs High) and 8th overall in the Sunshine State for all classifications. And guess who Eustis faces this Thursday? Yep, Winter Springs. “It should be a barn-burner!” Leea’s father, William says. Leea is batting an impressive .735 on the year with 36 hits in 49 at-bats and has only struck out twice all year. 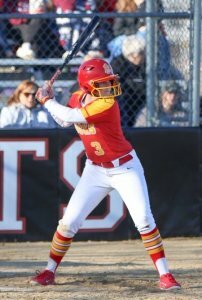 She has been a four-year starter in centerfield for Coach Brittany Beall’s team and the coach says she’s “doing fantastic” in a new role for the team, batting in the 3-hole. The Notre Dame signee is a triple threat who had two inside-the-park home runs last week. Leea says there’s a reason she’s taken her game to another level this season. She says she wasn’t aware during the week that she hadn’t made an out. Away from the high school fields, the Florida athlete has won two club national championships (Boulder IDT and Triple Crown Sports) with Jersey Intensity coached by Kevin O’Donnell, but travel ball is a ways down the road. Coming up first is the Winter Springs game and a chance for Leea to continue leading the Panthers towards a Class 5A title. Sydney Supple went 3-0 in the circle and had three home runs last week: Photo: Dan Frank. 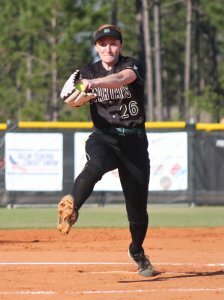 * Sydney Supple, the senior pitcher/first baseman with the Oshkosh (Wisconsin) North Spartans kicked off the season with four non-conference games wins against teams from Florida and Alabama during the Midwest team’s spring training in Florida. The Northwestern signee recorded three complete game wins and smacked a home run each of the first three games. In her 20 innings of work on the mound she also struck out 32 batters. The two-time Wisconsin Gatorade Player of the Year and 1st Team Extra-Inning All American showed her strength on both sides of the plate hitting .550 with a .667 on-base percentage and six RBIs. She was intentionally walked three times during the team’s win over Florida's 7A 2018 State runner-up, Niceville High, the fourth game of the week. Taylor Pannell batted .750 last week. * Taylor Pannell, a freshman at Rock Island (Illinois) High and an Auburn commit had a great week offensively and defensively. The lead-off hitter and shortstop/third baseman went 12-for-16 in four games (.750) average and had three home runs, eight RBIs and seven steals with no errors in the field. Her Rocks team is the defending Illinois 4A state champs and defeated the Class 2A defending title winners, Rockridge High, 8-3 as Taylor went 3-for-4 and was just a double away from the cycle. She also had two RBI and two steals in the win. * Keegan Moore, another freshman standout, had a big outing for her Ironton (Ohio) High team which is now 3-0 on the year. Keeagan got her second win from the circle as she racked up 18 strikeouts of the 21 Raceland (Kentucky) High batters she faced in the 5-1 win. Keagan also caught a line drive, fielded a bunt and made the out at first base, and caught a pop up for the last play of the game. Kiana Estrada had two home runs and six RBI in one game. 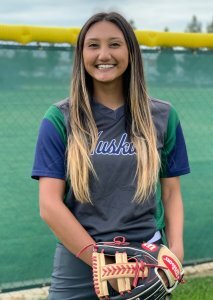 * Kiana “Kiki” Estrada, a freshman infielder for Chino Hills (California) High, only had game last week but the Arkansas Razorback commit made the most of it as she went 3-for-4 with two home runs, a single and six RBIs. In 20 games on the season she is hitting .481 with 26 RBI on five home runs, 20 runs scored and a .524 on-base percentage. 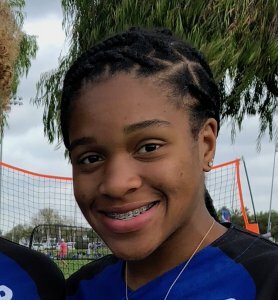 Kiki was ranked in the Top 30 of the 2022 Extra Elite 100. 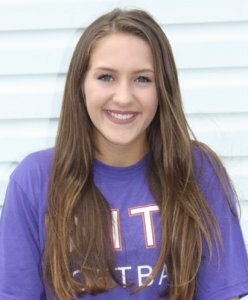 * Pitcher Chyanne Ellett improved to 15-1 on the season as she led Brownwood (Texas) High with a one-hitter and a two-hitter in which she had 15 and 16 strikeouts, respectively, with no earned runs this week. The Memphis signee also went 3-for-7 with three RBI at the plate and for the season has 239 K’s to only 22 walks. For her career Chaynne has 1,074 strikeouts for the District 7-4A program. * Madelynn Solow a junior centerfielder for West Penn Charter (Philadelphia, Pennsylvania) High batted .617 for the week as her Quakers team travelled to Tennessee where it played eight games and made several outstanding diving catches in the outfield. She returned home Friday for the school’s first home game and hit two home runs including one over the 220-foot centerfield wall. Kayla Sullivan went 4-for-4 with two home runs... that should have been three! * Kayla Sullivan, an 8th grader playing varsity for her Lewis County (Vanceburg, Kentucky) High team and hit .467 for the week in four games and in one game went 4-for-4 with two home runs and seven RBI. She would have had three home runs, but a teammate gave her a high five before she touched the plate and the umpires ruled it was a triple and an out. Kayla plays shortstop and utility. Brantleigh Parrott batted .538 and threw 16 K's. * Brantleigh Parrott, a freshman pitcher/utility player for Central Cabarrus (Concord, North Carolina) went 7-for-13 at the plate and pitched 9 2/3rd innings including a complete seven-inning game and had 16 strikeouts versus just two walks and allowed just two earned runs. She is committed to the Lander University Bearcats. 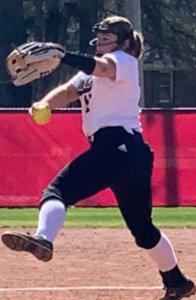 * Finally, special mention goes to junior pitcher Kailee Simpson, who pitches for the Russellville (Arkansas) JV squad. 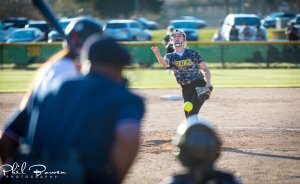 The night before the school’s softball season started, she broke her wrist in two places and for three weeks had a cast from her non-pitching wrist to her shoulder. This week she pitched with a cast up to her left elbow which allowed her to pitch and in two games she threw no-hitters. This after having reconstructive ankle surgery last season. That’s perseverance!